For the past couple of years I have helped friends get their olive harvests in. It’s one of my favorite times of the year! And those of you who have been following along with my story know that saying I am appassionata about the olive oil in Tuscany is an understatement. It’s WONDERFUL!!! And it’s doubly wonderful when it’s first harvested. The spicy, fruity, verdant oil tastes and looks phenomenal. My harvesting efforts have always netted me a few bottles of this precious oil and I just sleep better knowing it’s waiting for me in its place of honor in my kitchen. So imagine my panic when first my friend Adrian, followed by another friend Franca, told me that they weren’t harvesting this year. Come mai? Well unfortunately, we had a huge snowfall in the winter that caused damage to a lot of trees and this was followed by a immensely hot summer. 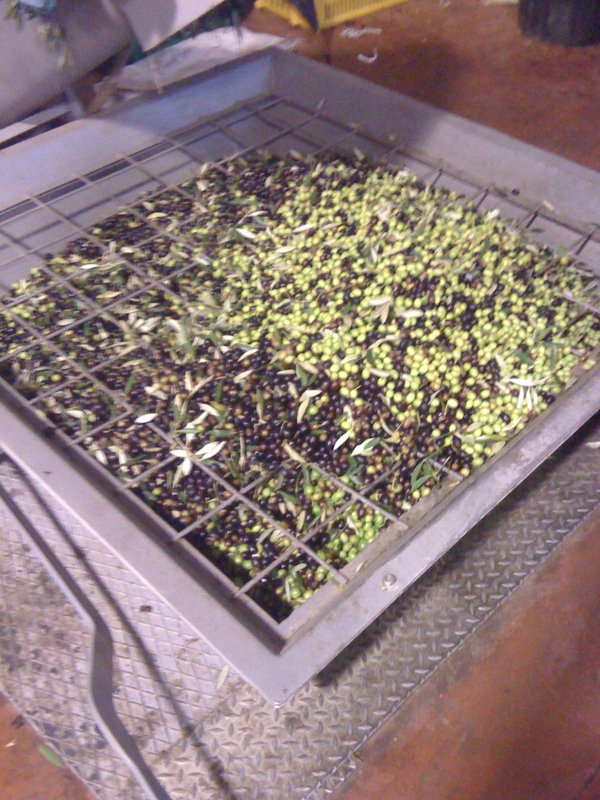 The result…very few olives. Adrian shook his head sadly when I announced that I was ready to pitch in for the annual raccolta. “The trees have hardly anything on them, it’s not worth doing this year.” NOOOOOO!!! And then along came Tania! Tania is a friend who I met while working at Poliziano. She loves our wine and so brings lots of tourists to us during the season. 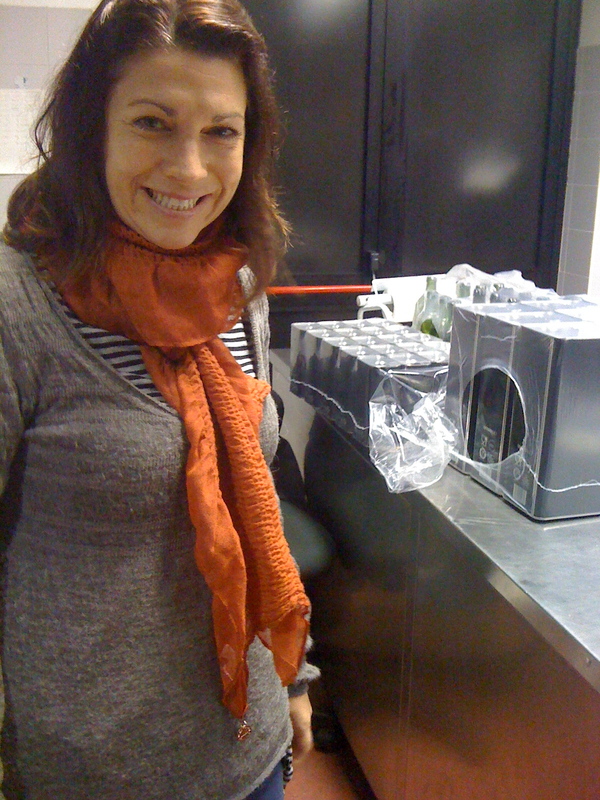 She and her husband began a small olive oil production a few years ago in nearby Monte San Savino and it has grown. They get their olives from their farmer neighbor, Raul, who has a bazillion trees and then they press at a local olive mill. Most of their business is in the States and what started as a few friends requesting oil has evolved into a pretty impressive operation. Knowing that my work had ended for the season at Poliziano, Tania asked me if I’d like to help out with the all important bottling and labeling of the olio nuovo to send to the US. This required only about two seconds thought on my part. 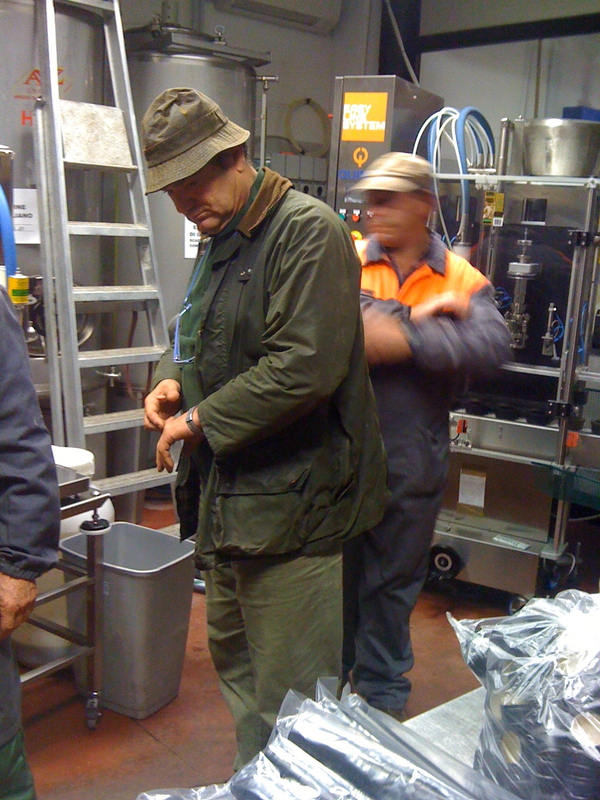 Yesterday, we went to their local frantoio, olive mill, to start the work of bottling every size and shape imaginable from baby 100 ml bottles to 3 litre cans. 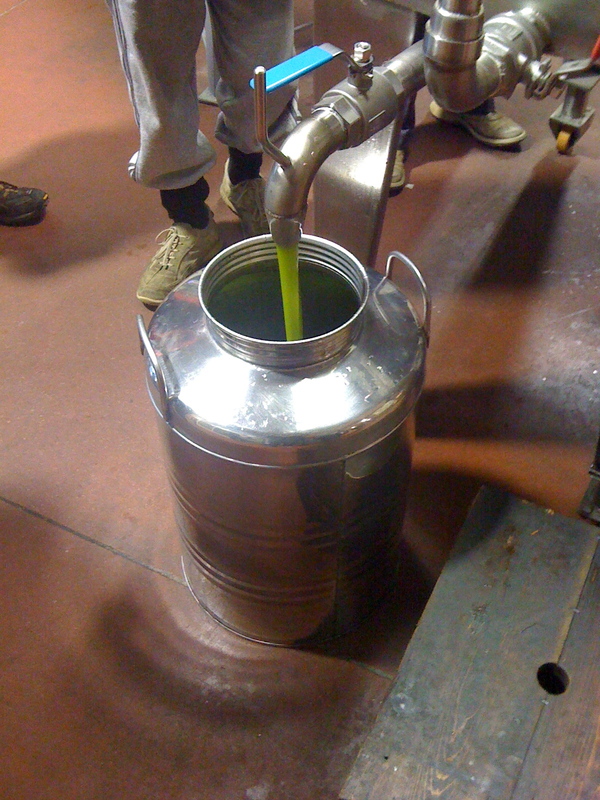 I hadn’t been inside an olive mill before since I was sick last year when Adrian invited me to go along for the pressing. It was very modern and state of the art. 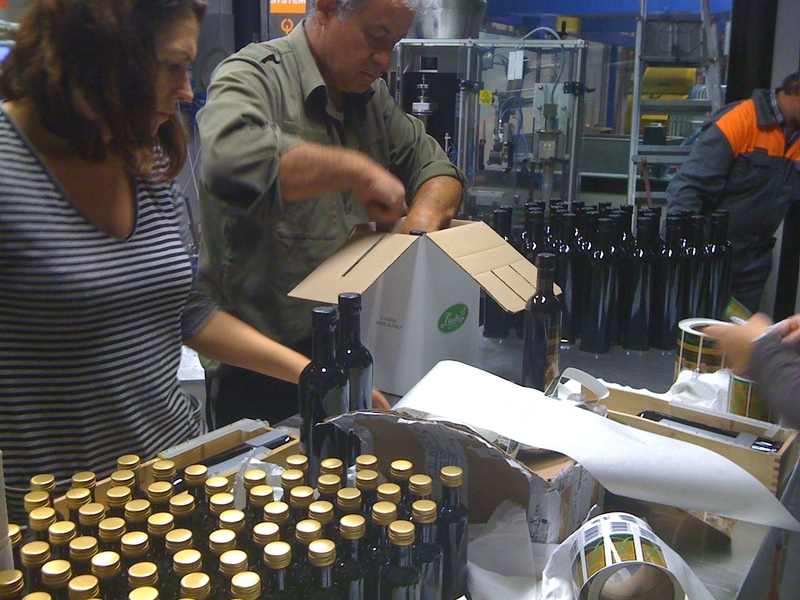 I wasn’t sure what the bottling work would require and since I am known to have a bit of a Lucy Ricardo tendency to get myself into mischief, it did cause me a little anxiety when I thought of being a part of an bottling assembly line. (Think chocolates being shoved into mouth!) As it turned out, it was a very relaxed genial atmosphere and most of my work was on the tiny bottles in a small room that was perfumed with the tantalizing smell of olive oil. 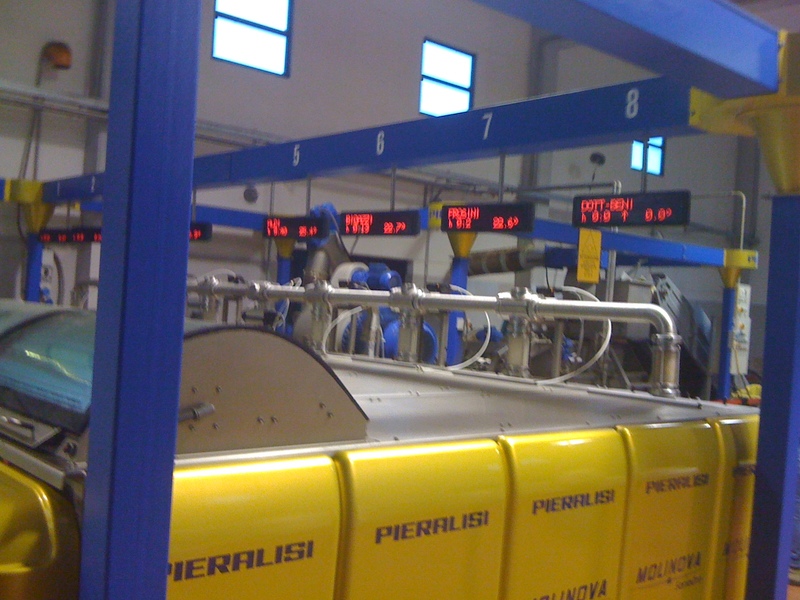 The mammoth bottling machine, which kept stalling and had at all times four or five Italians conferring and or arguing with each other, was left to those in the know. Tania assured me that the conferring and arguing happened every year and was a vital part of keeping the handcrafted machine running! At the end of the day I arrived home tired but with some delicious NEW OIL!! Those baguettes that I made on the weekend will be perfect for the oil’s debut on some bruschetta! And then the oil…need I say more? This is Raul, the man behind the oil. His trees produce the olives! 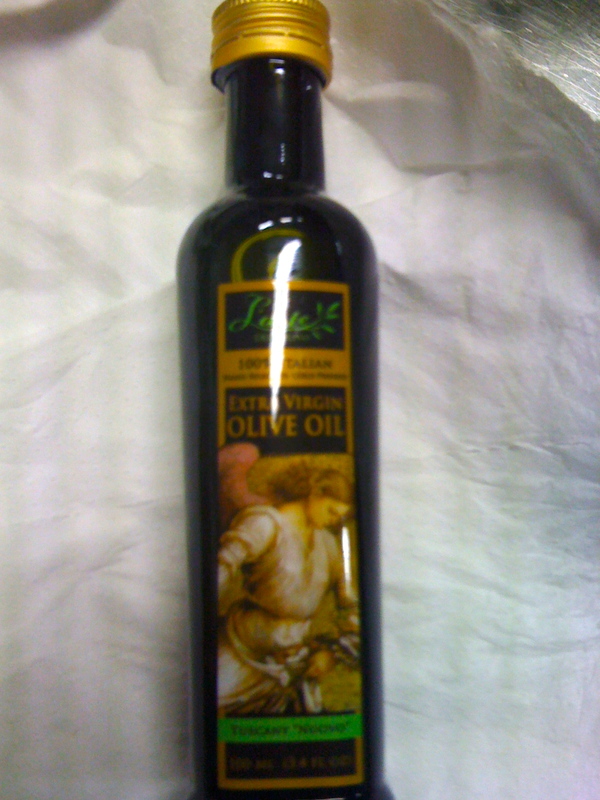 Jen, Glad you were able to get your precious olive oil this year. I think you always appreciate the product so much more when you see the whole process. Thanks for sharing, it is unbelievable that those little green globes can produce such a wonderful and important part of our daily lives. I’ll be looking for your tiny jars. Thanks for all your help, it was much needed! We finally finished putting on the pewter labels at 11:00 p.m. last night when they finally arrived and the shipment goes out today, will be on U.S. soil on Sunday!!!! Glad you could see some of our craziness, but worth it for the end result!!! It was a lot of fun for me! Any chance to hang out with grizzled Tuscan farmers is a pleasure. Add to that your delicious oil and well… Che piacere! Good luck with the tastings in the States!!! The fresh oil has such a beautiful, electric green color!